Ever the troublemaker, Monkey D. Luffy finds himself (literally) falling into the clutches of the Navy-controlled “Jail Island,” a formerly peaceful land on the brink of civil war. He befriends a young woman named Jeanne, an anti-Navy officer who seeks to free the island from the World Government's tyranny. At the forefront of this conflict is Isaac, the warmongering Navy warden whose aspirations spell doom for pirates and marines of all kinds. 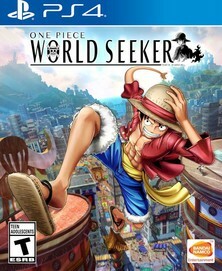 I'm hesitant to use the word “ambitious” to describe One Piece: World Seeker, because if we're comparing it to anything beyond licensed anime games, it looks like a half-baked cookie-cutter rendition of a million open-world adventure games—a genre that's become oversaturated in the gaming market. However, as a licensed anime game, there is some kind of alchemy happening among its many attempts to sit at the AAA big boy table, and the final product is far too interesting to completely dismiss as a failed experiment. World Seeker is everything you've come to expect from the “open-world” descriptor. It's first and foremost a checklist-management sim that employs its overworld as an endlessly reusable setting that you can freely traverse when you don't feel like fast traveling. You're much more likely to spend the game staring at the mini-map and keeping an eye out for objectives, treasure chests, and randomly spawned crafting resources than you are to actually take in the lush environment the developers have lovingly built for you. It's Assassin's Creed. It's Breath of the Wild. It's Spider-Man. But more importantly, it's Metal Gear Solid V. Straw Hat Luffy is the only playable character in the game, since the whole thing is designed to make use of his unique abilities. Luffy's stretchy arms obviously make for some Spider-Man web-slinging fun, but the most unusual design choice is making his famous Gum-Gum Pistol operate like an actual pistol by pulling on the L2 and R2 triggers—something the developers felt was so intrinsic to the experience that there's a permanent reticle on the screen. Topping this off is stealth gameplay, where Luffy will encounter Navy blockades propped up throughout the map, and players must decide if it's worth the trouble to fight their way through or be sneaky about it. Depending on how much you've upgraded certain skill sets, combat can be a fraught endeavor. I played through the game on Hard mode, and there were several notable difficulty spikes that required a little extra elbow grease to boost my skills and equippable items just to make the game playable again. The “stealth” mechanic is a perfect microcosm of what's so disappointing and yet magnetically compelling about this game. The only reason I can imagine anyone would put stealth in a One Piece game is that they just want to be like other open-world games. The HUD indicating the enemy's alertness is slick and modern, but the controls are simplistic and lack basic features like being able to crouch. You're playing a character who just wants to punch his way through life, inhabiting a world that's designed to make him stop and think his way through problems until it finally becomes clear that he can't. In that sense, it's the most authentic Monkey D. Luffy simulator that could possibly exist. That's kind of awesome. The story is also a rollercoaster of fascinating ideas that don't get the chance to marinate properly. Between the main missions and side missions, you'll be meeting civilians who fall into either the “pro-Navy” or “anti-Navy” camps. Some citizens are suffering at the hand of the police state, while others (usually the wealthy) are benefiting from it. The political exploration is about on the same level as the manga and anime series, where there's a complex problem without an obvious solution being further instigated by a diabolical villain who's just out for personal gain. However, as the story goes on, it simplifies into a more basic family/revenge plot. I was really looking forward to where some of these themes might be going, especially with the presence of a “Karma” system, but Karma doesn't quite work how I'd figured—in place of “objective” moral choice tomfoolery, you have ever-changing meters for each character depending on how much they like you. In practice, the system isn't really based on any morality at all. It's just another series of simplistic checklists and percentage bars. Between the pirates, the Navy, and the civilians of Jail Island, you've got a ton of different characters with strong opinions about right and wrong, but the actual mechanics of the game don't have a chance to factor into it. The plot also suffers from the way the game is structured, because most of what we learn about Isaac's devious plan comes through side-quests. Since you can do these quests in almost any order, the main story can't acknowledge them until the very end. There are a handful of genuinely emotional scenes far exceeding what you'd expect from a licensed game, but the full journey leaves something to be desired. Visuals are possibly the game's greatest strength. The world is easy on the eyes and Luffy is animated enough to ensure maximum whimsy. So it's a shame that the beautifully-crafted cutscenes don't cover a larger degree of the story, because the voiceless dialogue segments are where the game feels its cheapest. It wouldn't be such a problem if talking to NPCs didn't frequently lock the camera in stunningly unflattering positions. Luffy doesn't mean to talk with his crotch directly in children's' faces! He's just socially inept, I swear! World Seeker is an earnest attempt to make a One Piece video game that feels prestigious on the same level as the series' movie releases. It's trying its hardest to learn from the biggest video game releases of the day, it has character designs from Eiichiro Oda himself, and it features a wonderful Dragon Quest-y soundtrack from series composer Kohei Tanaka. However, rather than being film-caliber I'd say it feels much closer to one of the TV specials, where there are aspects of undeniable quality and ambition, but on the whole it's doomed to be forgotten. Whatever nuggets of ingenuity might exist aren't guaranteed to ever reach the audience. I've sincerely enjoyed my time with World Seeker, and I hope that I'm not giving the impression that this game's shortcomings are too much of a burden. I have a soft-spot for open-world checklist games, and immersing myself in one that happens to be One Piece-themed has been surprisingly rewarding. Luffy really is the “right” character to center a game like this around. The core gameplay loop of slinging yourself around trees and rooftops makes the treasure-collecting and quest-filling experience even more fun, and wherever there is polish to be found—it's definitely not everywhere—the impact it has is undeniable. It may be a good game waiting for its chance to become a great one, but the fact that it exists at all is still pretty novel.